It can be difficult deciding where to take your fling on holiday. You don’t want it to be too romantic because it might give her the wrong idea on how serious you are. But then again, you don’t want it to be somewhere you take your friend because you do hope to get lucky with this lady as well as enjoy your time together. For a mix of both romantic and light, check out these hot spots for your next holiday. Cornwall has miles and miles of beautiful beaches, which is enough to keep any woman happy. But walking hand in hand along the sand isn’t all this town has to offer. During the day take a short trip to The Lost Gardens of Heligan. The Gardens have everything from vegetables to forest growths that will keep the two of you walking about for hours admiring the scenery. If foliage isn’t so much your thing then take a day to shop. Cornwall has shopping areas that range from normal to eclectic. Boutiques offer unique paintings and artwork, while Lostwithiel has something for hunters. There’s bound to be something for you and your girl to pick up. If you’re on a shorter holiday, head to Cardiff to experience their three big attractions. Cardiff Castle, Millennium Stadium, and the National Museum all reside in the town and offer at least a couple of day’s worth of entertainment. The castle is what it sounds like, a castle. But that doesn’t mean it’s boring. Visiting something so different from how you would normally live can be fun for a while, plus ladies often romanticize castles so she’ll enjoy it. The Millennium Stadium is for the sports fans out there. The stadium itself looks amazing. It hosts rugby, motorsports, football, and even music if sports aren’t your thing. Let’s say your girl is more artsy. Taking her to the National Museum will definitely earn you some points. Together you can learn new things about archaeology, natural history, geology, and of course, art. Besides the exhibits they also host events so be sure to check out their website when planning your trip. The museum is also a cheap date; admission is free. 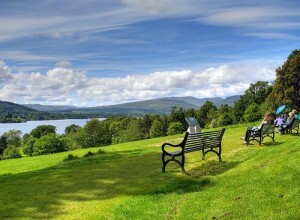 If you’re looking to get away from it and spend some quality time with your lady, head to Loch Lomond. Loch Lomond is in the Trossachs National Park about 20 minutes outside of Glasgow, but in this outdoor paradise you’d never even know that there’s a range of activities to do including visiting Puck’s Glenn (named after the Shakespeare character), climbing Ben Lomand (just to see the fantastic views from the top), grabbing a sample at one of the 12 whiskey distilleries in the area, and exploring the trails that run through the area. There are so many areas to cover; you might want to take a few days to see them all. Where you take your temporary (or not-so-temporary) woman doesn’t matter so much. What does matter is the tone and plans that you set for your journey. It can be as romantic as you want it to be.